Back in January we launched a special, 12 month long partnership with five very talented bloggers dubbed the Earthborn #claymates. Throughout 2019, our five fabulous bloggers will be using Earthborn paints on a variety of projects in their homes. They’ll be showing how beautiful and unique our eco-friendly paints are, and hopefully inspire you with your decorating and home renovation plans too! In this post we introduced our five #claymates with links to their beautiful Instagram accounts and inspiring blogs. 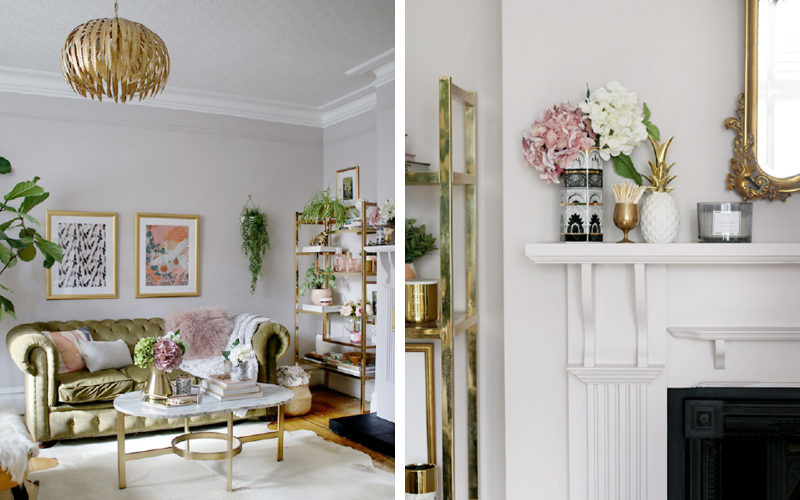 We thought it was time to share a little more about each blogger, their totally unique decorating style, and their 2019 interiors projects. 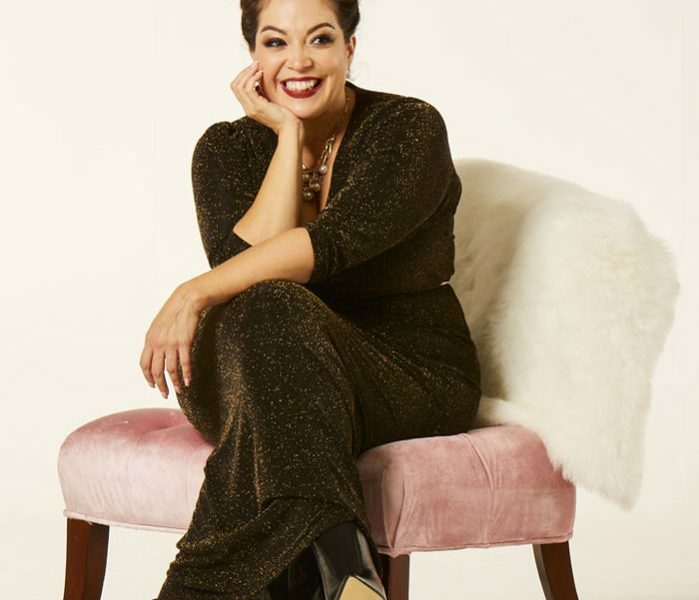 In this post, we’re delving into the glamorous home of Kimberly Duran of Swoonworthy Blog. Kimberly recently moved to a stunning Victorian house with many original period features, and was already familiar with the unique qualities of Claypaint and its suitability for older properties. She is about to embark on an exciting extension project during 2019 so we’re looking forward to see how her plans unfold. 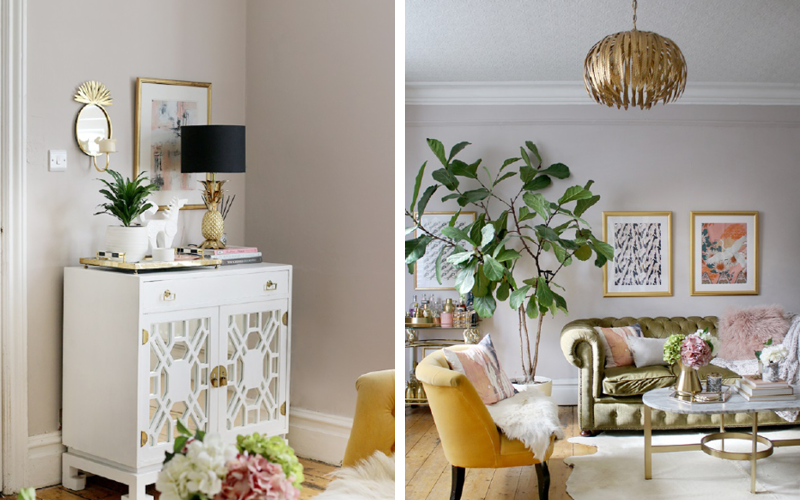 However Kimberly’s glamorous and eclectic style also lends itself to easy make-over ideas and small scale DIY projects, as showcased on her inspiring blog. “After moving into our beautiful Victorian home last year, we have a huge project ahead of us, updating and refreshing the space and ultimately, making it our own. With a period property, it’s important that we use paint that allows our old walls to breathe properly and using eco-friendly Earthborn paints mean it’s good for the house and good for us too with no added VOCs and a creamy texture which covers beautifully. Fast forward a few short months and Kimberly has already completed her first room makeover, of her living room, ahead of embarking on larger scale building work. She chose the subtle, mushroom shade of Paw Print, turning this space from a bold purple (which wasn’t necessarily to Kimberly’s taste!) into a calm, sophisticated living room featuring neutral colours and metallic accents. As Kimberly explains in her blogpost, she has bigger plans for this room after her kitchen extension is complete. This surprisingly quick project truly shows how a lick of paint can completely transform the look and feel of a room. If you’d like to learn more about how she achieved this beautiful room, head to Kimberly’s Swoonworthy blog here. And if you’re inspired to try this purrrfectly pleasingly shade, click here to order a sample pot of Paw Print! Be sure to check back here for more updates on the rest of the Earthborn #claymates! And don’t forget to follow Earthborn’s own Instagram account where we will share more in the coming weeks!